The other day I was googling some lower back pain that can probably be attributed to years of hunching over computers. A helpful WebMDheadline popped up and next thing I knew I was diagnosing myself with lung cancer. This is nothing new. WebMD has been torturing hypochondriacs since before the internet was used to locate hot singles that want to meet you. And poor souls like me have been complaining about it since then. Recently, Twitter's seen an uptick in disgruntled WebMD-ers letting it all out. It's good to see we're not alone in our certain deaths. Sit back and enjoy this rage-inducing text story. Let's focus on a cure for cancer. Astrology memes are completely taking over the Instagram meme scene, and it's not hard to see why. The memes are pretty much relatable to everyone - even the skeptics. This particular set from @crabcomplex roasts our fears with the classic crying girl/dolphin pic that's been all over the internet. It's straight from the Devil himself. The world, and especially the meme community, is mourning after news of Stefán Karl Stefánsson losing his 2 year battle with cancer. The Icelandic star of the Nick Jr show LazyTown has long been hailed as a hero of the meme community. His character, the scheming "villain" Robbie Rotten, has been the subject of viral memes for over four years. Stefánsson's battle with bile duct cancer inspired a heartwarming effort within the oft-irreverent r/dankmemes community. The subreddit played a huge part in raising money for the actor via what became a wildly successful GoFundMe campaign. 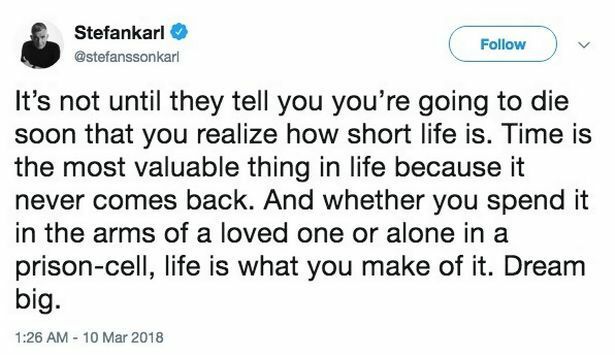 Along with raising money, the subreddit dedicated many uncharacteristically wholesome memes in the actor's name, a movement the community has revisited upon the news of Stefánsson's death. Stefán was very aware of his internet fame. He filmed a "thank you" video for all his supporters and took part in a Reddit AMA to engage with his devotees. The star disappeared from social media in March - and his last tweet is somewhat of a tearjerker. We're sending lots of love to his friends and family, and have included some of the wholesome memes r/dankmemes has been posting in his memory. The subreddit has dedicated 24 hours to Stefán Karl Stefánsson, so head over to the page for more tears and love. He'll always be #1 in our eyes. If you've been on the internet at all over the past few days, you probably noticed that this photo of Ariana Grande and her fiance, SNL's Pete Davidson, has been making the rounds. The photo features a lollipop-licking Grande staring up at her hooded beau, almost in awe. The contrast between the lovers has influenced some seriously funny memes - including these gems from our favorite Instagram astrology account, @notallgeminis. Finally, some good news: Internet meme-god Stefán Karl Stefánsson of LazyTown has beat cancer (for now). The Icelandic actor has had a lengthy battle with the disease, and Reddit communities such as r/dankmemes have been rooting for him the whole way. Just over a month ago the outlook on his illness was grim, so this news has been met with much jubilation. While the prognosis is unclear the metastases have been removed but return) we're still over the moon. Here are some of our favorite celebratory memes - we wish Stefán a healthy future!